Think you did an OK job of installing your kid’s safety seat? Think again!!! Did you know that over 80% of car seats are installed incorrectly? What makes you think you’re part of the lucky 20% that did it right? Car seat safety checks are an eye-opening experience. Trained inspectors not only install the seat correctly, they also train you how to do it yourself. While you’re there, they check for recalls. They are obligated to send your child home safer than when they arrived. If a seat has been recalled, they will replace it with a safe seat at no charge. As many times as I’ve gone to car seat safety checks and watch what they do, I’ve never been able to successfully install it on my own. Plus, it helps to have two people to twist the long belt and pull it tight enough so that it doesn’t wiggle around. A couple of times they have even used pool noodles placed under the seat to achieve a safer angle. I could read the manual 100 times, and not understand it like they do. An added bonus is that safety checks are often held at fire houses, police stations, or ambulance bases. Kids can stay busy while your seat is installed by getting an up-close look at the trucks, cars, or buses. Sometimes they even give out stickers or other fun kid things. 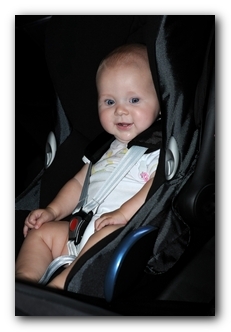 Car seat safety recommendations and laws are constantly changing. Take the picture in this photo for instance. Car seats are now 5-point harness (this picture is 3 point). When I was a kid my dad made my car seat out of wood. When we were older, we teased him and called it a “baby catapult.” Of course, he didn’t intentionally put us in danger, what parent would? He just didn’t know any better. Many safety checks have information booklets you can take home to read up on all of the latest safety news. You’d be surprised how much you might learn. Find a local place to get your car seats checked and installed properly at: http://www.seatcheck.org/ or http://pediatrics.about.com/library/car_seats/bl_carseat_inspection_stations.htm.